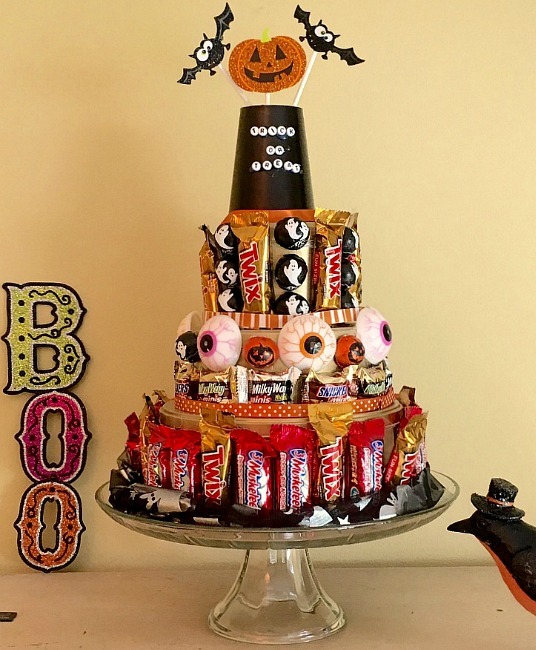 There is still plenty of time to put together this sweet Halloween candy cake. Plus you probably have all the supplies already in your home. I made one of these “no-bake” candy bar cakes about five years ago out of regular sized candy bars. We used it as a prize for a dance contest at the kids school. This time I chose to do one with a Halloween theme. It’s nice to work with the smaller candy and it they come with great trick or treat wrappers. You can take this cake in any direction you want. 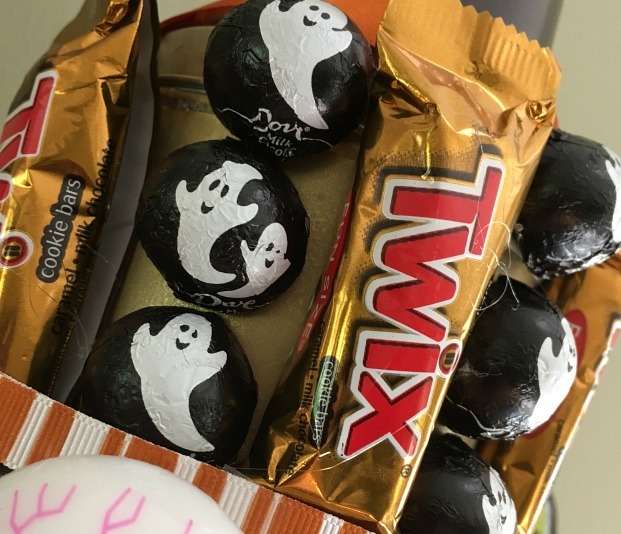 It can be scary, pumpkin-ey, all one kind of candy, whatever kind of candy you like, two layers, square shaped, glow in the dark, lit-up or whatever else pops into your head. We made in within a few hours one afternoon. I think it would be fun as a center piece at a Halloween party or maybe as the prize to your costume contest. Use your glue gun to draw a bead of glue on lid of the bottom tin and place the second tin securely in the glue, wait for glue to set before repeating step with the last (smallest) tin. Once the glue has dried you can spray paint the “tin cake”. 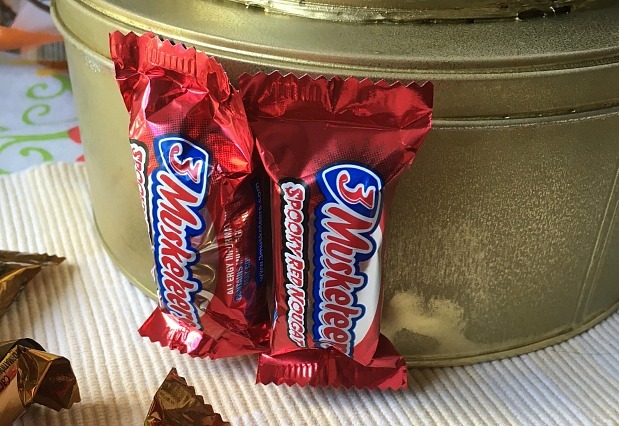 This is totally optional, since the candy and decorations will cover 99% of the tins. Wait for the spray paint to completely dry. 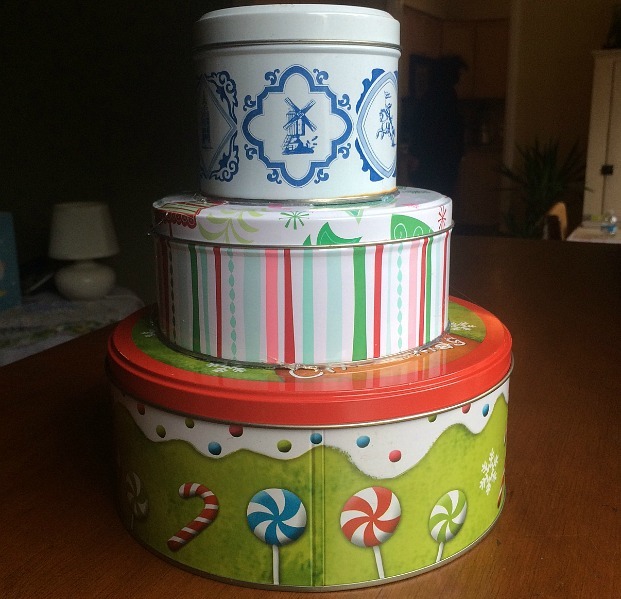 Lay out your pattern and make sure you have enough of each kind of candy to go around the tin. 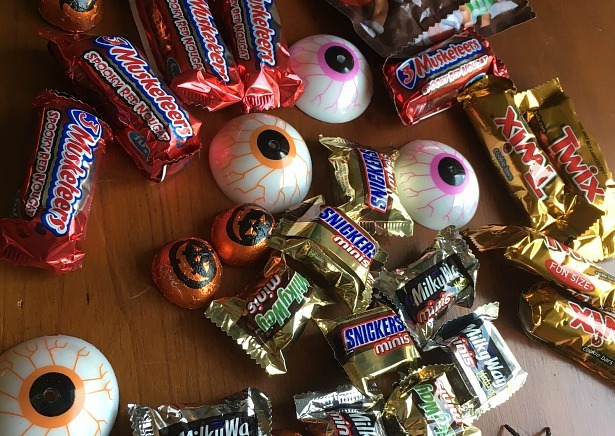 Hint – don’t snack on any of the candy until you know you have enough. Place a strip of the double sided tape on the back of the candy bar and stick it to the tin, pressing firmly. 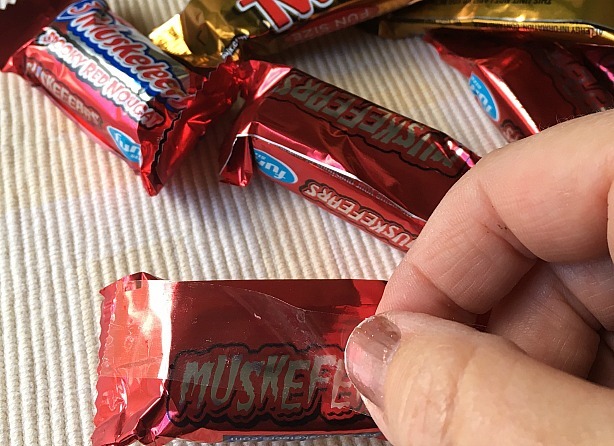 Since the Halloween candy comes in the fun-size the tape should hold them well. Mine are all still sticking nicely and it has been a week since I made the cake. Note: I prefer to have my candy all facing the same way for a neater look. 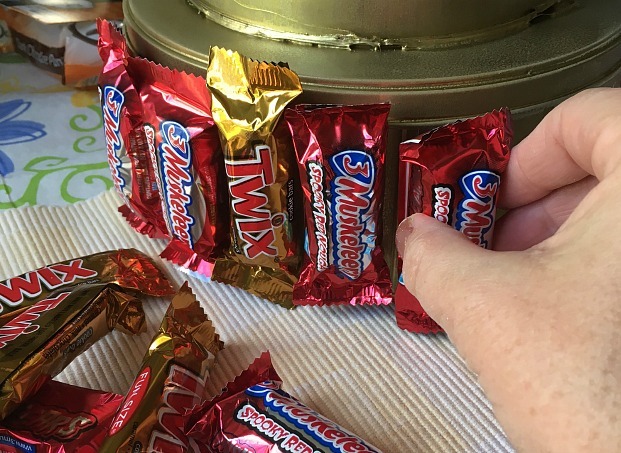 Continue this process until you have covered your tin with the candy. 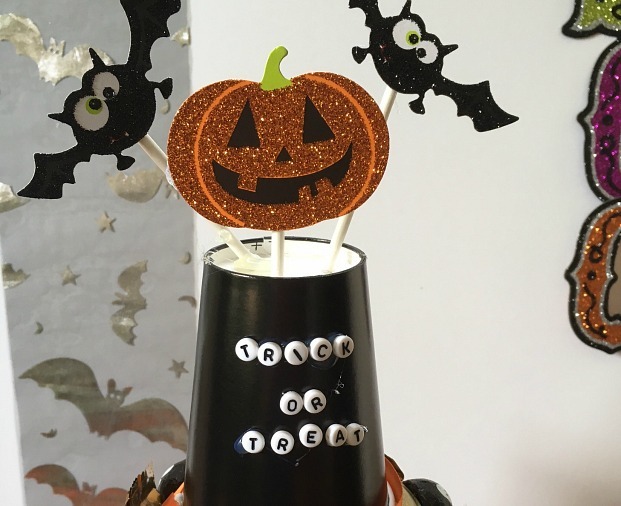 Make a topper for the cake using an inverted paper cup. 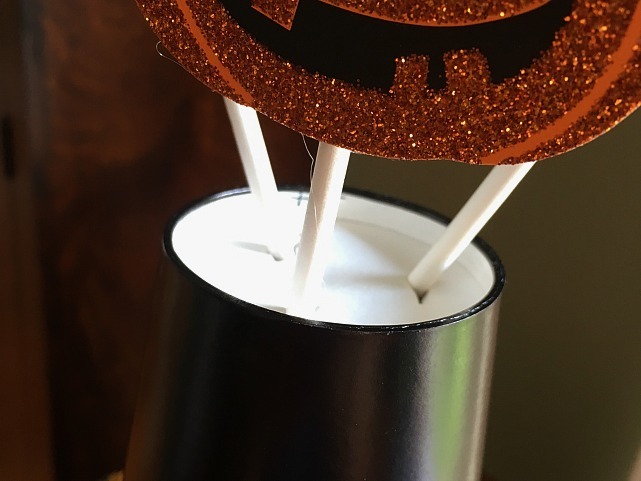 I cut slots in the top and inserted cake pop sticks that I had glued Halloween shapes to. I put a dab of glue where the cake pop stick went into the slot to hold it at the level I wanted. Then glue the cup to the top tin just like you did when securing the tins to each other. You could skip this step and just set a small pumpkin on the top of the cake. Wrap festive ribbon around the bottoms of the candy to make it look finished. That’s all there is to it! 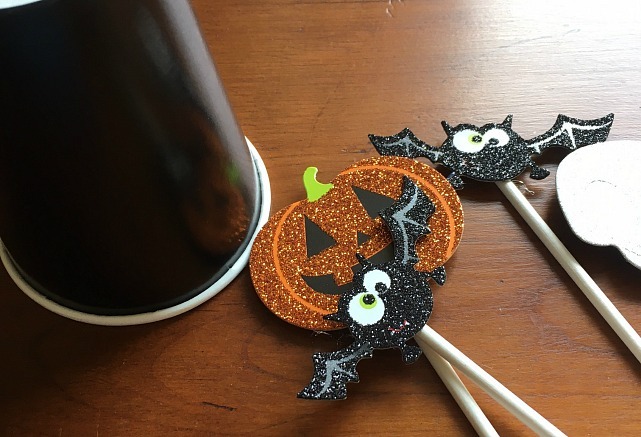 It’s very easy to put together and everyone will think you spent way more time on this candy craft than you actually did.